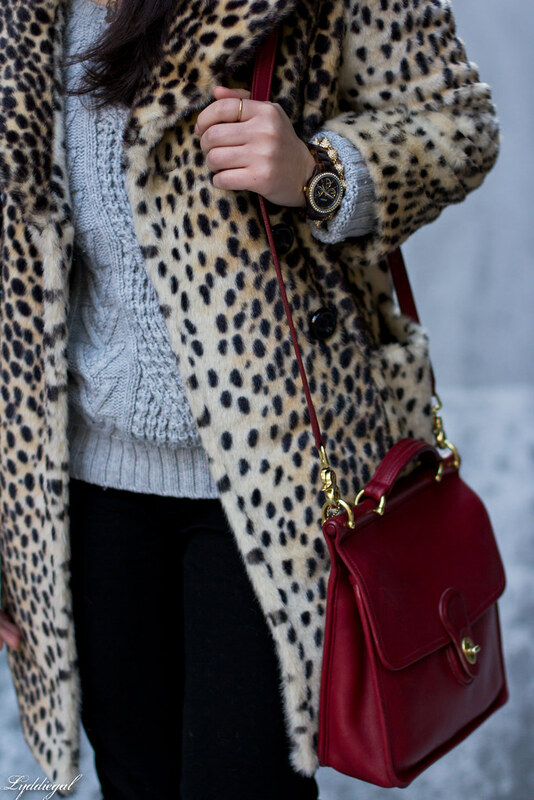 This leopard coat is a lot warmer than most people tend to think, and with the addition of some long gloves and a big scarf, it's quite cozy. Comfort was my main goal for the weekend, and I always feel like it is the biggest challenge to try and create a look that is going to keep me warm, not kill my feet, and still be blog-worthy. Hopefully this was a success. I agree Lydia the faux fur is a lot warmer than people may think. Love this casual chic look. Sometimes what I post on mine are totally NOT blog-worthy, ha ha. Success indeed! I love the leopard and gray! I love the coat! I saw something sim at Century 21 over the holidays and you have me regretting not snagging it! Totally blog-worthy. I seriously want that jacket so much it hurts! 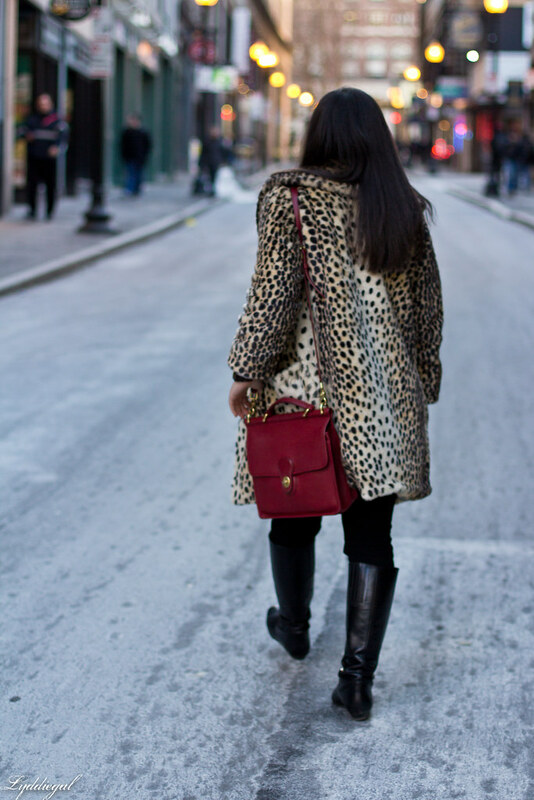 Any look involving your leopard coat is a guaranteed success as far as I'm concerned - but especially when it's paired with black, gray and red. Everything about this is perfect. I'm actually sitting here typing and pondering how I can recreate it from my own closet! You look Great here and comfy. That coat is a must have for those in the colder climates. I'm in love with your coat and bag! You look amazing! i have a similar fur coat and i wear it as much as possible! its just darling on u! 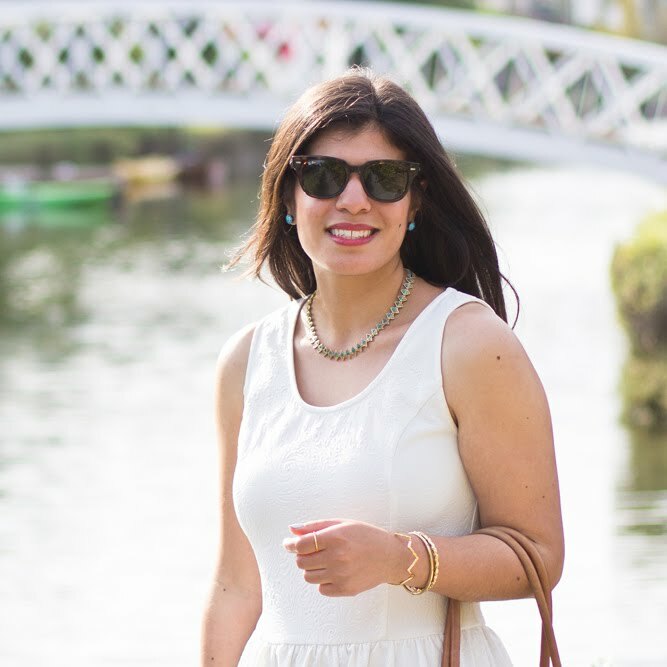 If your goal was to be stylish then I think your look was perfect! I love all of the details from the print of the coat, to the zipper on the boots, and that bag is gorgeous! You really get so much use out of that coat, I love it! I love the combination Lydia! There's nothing like a pop of color and a fun print! Ugh. You are killing me in that coat lady. You are the only one I know that manages to look chic while in a coat. Love it! It's a really pretty coat that can be worn with so many things. Great bag! I love that coat. I want it. It is fabulous!! I have been wanting a leopard coat but I haven't been able to find the right one. And that bag is gorgeous!! seriously love that coat..perfect look! 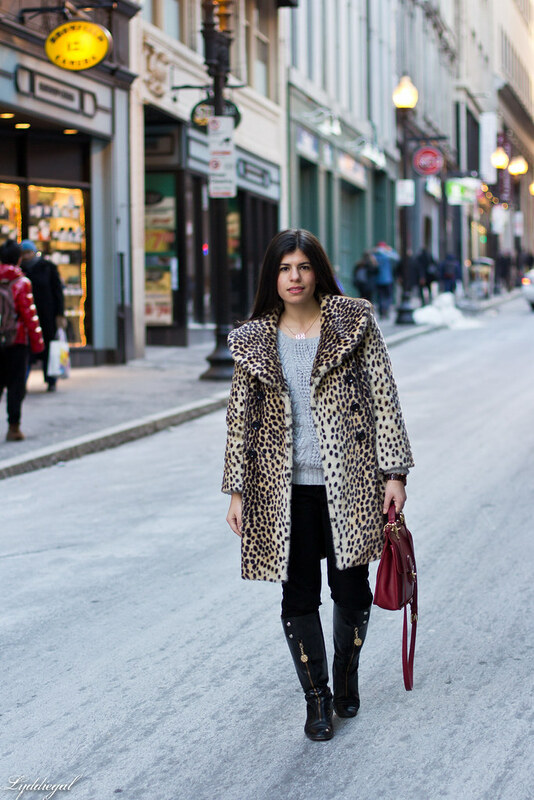 This is seriously the best leopard coat. Sometimes faux fur is super warm. I have a really really old vintage faux fur from a thrift shop that's like a furnace. I sometimes joke that it's probably made of asbestos... of course, it actually could be. Eek! You are truly looking warm & cozy without sacrificing style in this look....& great backdrop too!!! And it's still cold everywhere! It's March, what the heck, man?! Well, you're definitely looking snazzy in these last few days of winter, which I applaud you for. 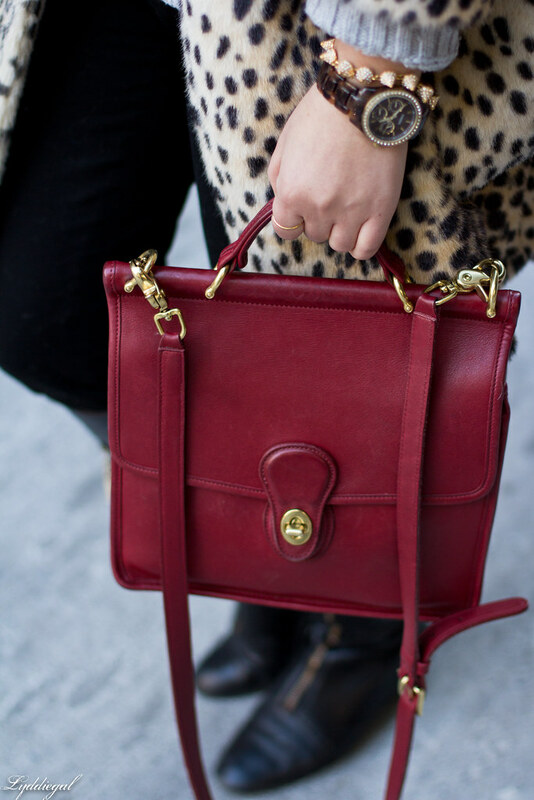 Leopard and red are always so delicious together! Seriously, a statement coat is such a great purchase. I haven't posted many outfits lately b/c, really, how many people need to see my green coat on repeat. Haha. Oh wow, this is gorgeous and it looks so warm and cosy. Loving the bag. I imagined it was cozy… and who's taking your picture?